Sen. Ben Nelson’s (D-NE) decision to retire makes a Republican takeover of the Senate a little more likely, but just a little more. It does not dramatically change the Senate landscape. Why? Because Nelson could easily have lost if he ran again. Still, out of deference to the powers of incumbency, we had previously kept Nebraska as a toss up. Now that Nelson has retired, we have switched our rating in this race to LIKELY REPUBLICAN, and that could become “safe” eventually. It appears that the only big-name Democrat who could make this a race is former Sen. Bob Kerrey, but we’ll be surprised if he runs. Apparently, the remaining Democratic bench consists of various mayors and state legislators who would have a steep uphill climb to victory. In any event, the Republican nominee for president is likely to get 60% or more of the vote in Nebraska, which will make it very difficult for the Democratic candidate. This is a polarized, highly partisan era, very different than the one that nurtured such Nebraska Democratic U.S. senators as Kerrey, Nelson, Jim Exon and Ed Zorinsky. In 2000 Nelson won a Senate squeaker despite George W. Bush’s 62% in the Cornhusker State. This feat will be very tough to duplicate in 2012 for any Democrat. Democratic hopes of retaining the Senate are starting to rest heavily on defeating either or both Sens. Scott Brown (R-MA) and Dean Heller (R-NV). Remember, Democrats currently hold a 53-47 edge in the Senate, so Republicans need to only pick up four seats (or three seats if they win the presidency because a Republican vice president would break ties) to win the Congress’s upper chamber. The underlying and near-absolute requirement for Democratic retention of the Senate is that President Obama recovers and wins fairly handily. Even that doesn’t help in North Dakota, Nebraska, Missouri and Montana, where Obama will do poorly and where Democrats are trying to hold seats. Another consequence of the age of polarization means more straight-ticket voting. Of course, such a trend cuts both ways and is bound to help Democratic candidates Elizabeth Warren and Rep. Shelley Berkley in Massachusetts and Nevada, respectively. The range of possible Senate results heading into 2012 appears to be a skin-of-the-teeth Democratic majority (50-51 seats) to a flip of about 53-47 GOP control. Naturally, strong partisans disagree with us. Democratic leaders insist they won’t lose any seats, while private Republican estimates are that the GOP could have 56-57 Senate seats next November. Currently, we believe both parties are too optimistic. Now that ex-New Mexico Gov. Gary Johnson has announced his candidacy for the Libertarian Party’s nomination in 2012, we wondered: How has the Libertarian Party performed in presidential elections? The answer: Not particularly well. Founded in 1971, the Libertarian Party ran its first presidential candidate, John Hospers, in 1972. It has run a candidate in every race since then and bills itself as the “third largest political party in the United States.” In terms of success in presidential elections, the party’s apex was 1980, when Ed Clark managed to win 1.1% of the popular vote; he remains the only Libertarian candidate to poll above 1%. 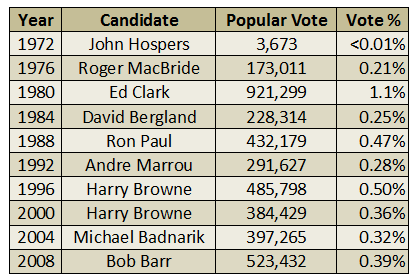 Interestingly, the party did receive an electoral vote in 1972 when Virginia elector and eventual 1976 Libertarian nominee Roger MacBride proved to be a faithless elector by casting his electoral vote for Hospers instead of Richard Nixon. Given its lack of success in presidential elections, it is tough to say how much of an effect the former governor’s candidacy could have on the election in 2012. Of course, Johnson has to win the party’s nomination first. The party would also be interested in having Rep. Ron Paul or former Minnesota Gov. Jesse Ventura run under its banner. A Paul run would certainly impact the 2012 election; having run as the Libertarian candidate in 1988, the Texas congressman could do so again. He could also launch an independent bid in an effort to expand his targeted electorate. If Paul ran as an independent, he would garner much of the vote Johnson (or whoever is the Libertarian nominee) could expect to win otherwise. The French Institute for International Relations hosted Center for Politics Director Larry J. Sabato last week for a lecture series on the 2012 elections. While in Paris, Sabato was also a guest on France’s international news station France 24, where he discussed the upcoming U.S. presidential race. To see the interview (in English), click here. Crystal Ball staffers are prohibited from betting on election results in any forum, public or private. This prohibition includes everything from Nadex contracts and Intrade to Iowa Electronic Markets and informal betting pools. Having any financial or personal stake in the election results is an obvious conflict of interest.